How divided is the current Supreme Court? On the surface the answer appears mixed. Much conversation over the past several years surrounding the court’s decisions has had to do with partisan and ideological divisions among the justices. These divisions and the court’s rightward shift appear a reality as evidenced by the systematic victories of the court’s conservative wing in ideologically divided 5-4 decisions from last term. These divisions do not necessarily define the court, however. Along with clear divisions, the Supreme Court under Chief Justice John Roberts has also reached new heights of consensus. The justices regularly split their votes along ideological lines when dealing with particular issues. The justices, however, are more often a united front then a separated one. This is particularly the case under Roberts. The regular consensus among the justices may actually be a product of the justices’ conscious efforts (as this historical study argues). Consensus is especially notable in the justices’ decisions early in the Supreme Court’s terms. The court has already decided several notable cases this term by unanimous vote. This level of agreement does not mean, however, that these decisions are not ideologically charged. In fact, the justices are still highly ideologically motivated even when they reach high levels of agreement. The objects of interest used to gauge the justices’ differing views early in this term are different from the justices’ votes on the merits of orally argued cases. Roberts has not only been successful in garnering unanimous coalitions at the beginning of terms. 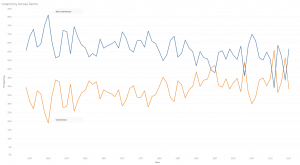 The court under Roberts (and Chief Justice William Rehnquist) steadily increased the percentage of unanimous decisions across terms so that reaching a level of unanimous decisions in orally argued cases of 50 percent is no longer an anomalous occurrence. These unanimous decisions convey consensus and legitimacy even when the justices appear fairly divided below the surface. Perhaps not surprisingly with the center of the court shifting rightward over the past several terms, most of the dissents have come from the court’s liberals, with Sotomayor and Ginsburg leading the way. Focusing on the instances when justices disagreed from a summary order, including dissents, “would grants” and “would denies” (referring to how a justice specifies he or she would vote on a petition in alternative ways from the court’s majority), we see certain justices regularly opposing particular court coalitions. 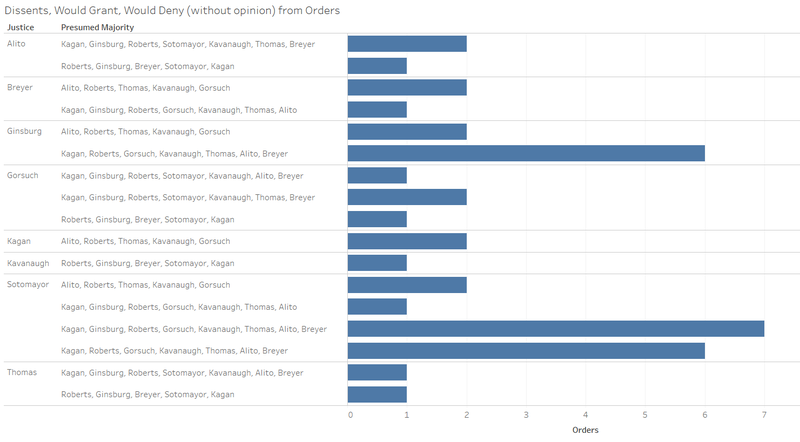 The graph below shows these dissenting justices and the presumed court majorities based on other justices who did not specify a position on a given order. Sotomayor and Ginsburg also lead in this respect. 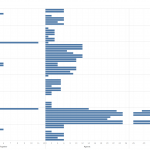 The longest line in this graph relates to episodes when Sotomayor was the lone dissenter on an order. This is followed by instances when Ginsburg and Sotomayor were the two dissenters. A slew of combinations make up the next tier of dissents, including when the four more liberal justices – Justice Stephen Breyer, Ginsburg, Kagan and Sotomayor — twice dissented from summary orders so far this term. 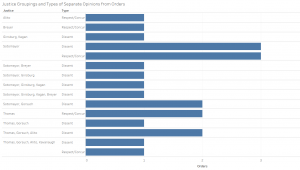 Focusing on dissentals and concurrals from orders (written dissents or concurrences from cases summarily decided or rejected by the court), we see a fairly consistent aggregation of the justices that accords with the data above. As with the summary dissents, Sotomayor in her solo capacity led the justices in both written dissents and concurrences relating to the court’s orders. Sotomayor and Gorsuch dissented together twice, as did the four more conservative justices – Justices Clarence Thomas, Neil Gorsuch, Samuel Alito and Brett Kavanaugh. 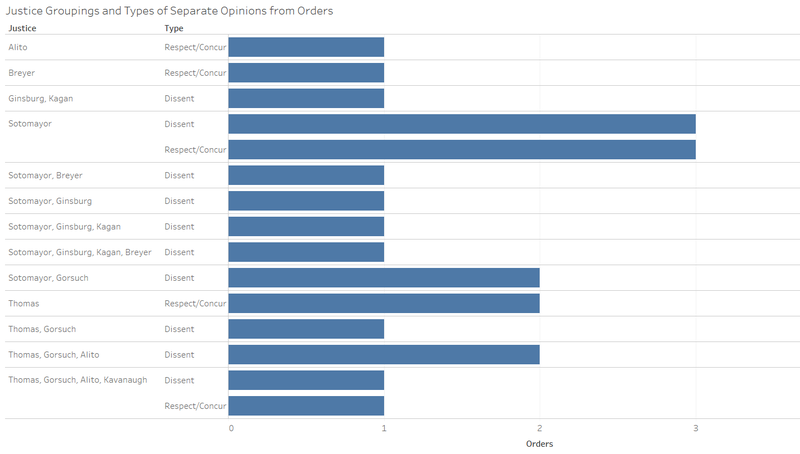 Breaking these data down into specific issues, we see that many of the repeat dissents or concurrences from orders came in death penalty cases. Sotomayor, Breyer, Ginsburg and Kagan have all dissented (some more frequently than others) in cases upholding capital punishment against a variety of challenges. Thomas also concurred with a death penalty decision and dissented from a decision upholding a challenge to the death penalty in White v. Kentucky. When we aggregate all of this behavior, we get a bird’s-eye view of the justices’ consensus and lack thereof outside of the Supreme Court’s merits docket. 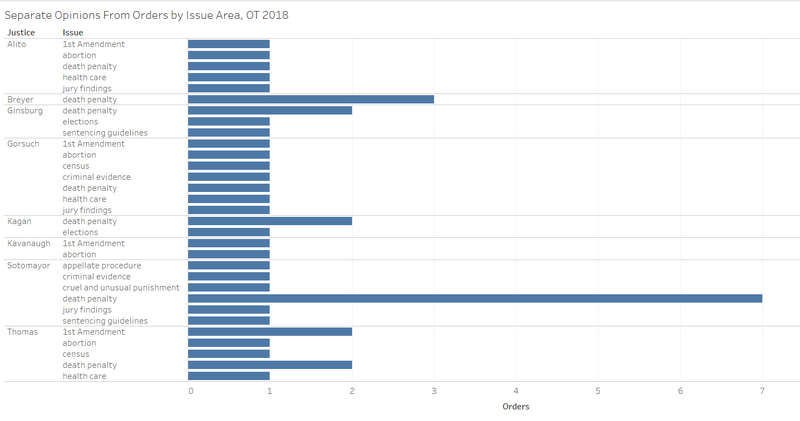 The following graph shows all groupings of justices who deviated from the court’s majority in the shadow docket so far in OT 2018. 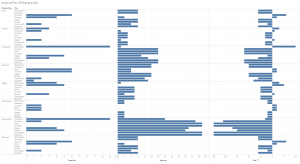 The first column shows all instances when justices dissented together with any other justice; the second shows when the same justice dissented and the other justice did not voice a position. (We assume the other justice was in the court’s majority.) The third column subtracts the “Against” column from the “Together” column to give a net amount for each justice pair based on the dissenting justice listed on the far left. Because certain justices were far more involved in dissents than others, the numbers do not give as much leverage on understanding behavior between dissenting justices as they do on understanding the behavior of each individual justice and within that justice’s various pairings. 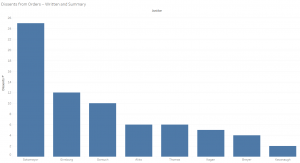 The data for Sotomayor, the Supreme Court’s most frequent dissenter so far this term, provides a good example of the benefits of analyzing the data in this manner. We see that due to Sotomayor’s many solo dissents, she was in the court’s minority by herself more frequently than she dissented with any other justice. Because she dissented 11 times with Ginsburg, she was also part of the most frequent dissenting pair. Still, Sotomayor dissented three more times without than with Ginsburg, so the net for the Sotomayor-Ginsburg pairing based on Sotomayor’s dissents is -3. Because Sotomayor dissented twice with Gorsuch and zero times with Alito, Roberts, Kavanaugh or Thomas, we see that her net with Gorsuch is two above her nets with the other conservative justices. The net figure with Gorsuch is not far off Sotomayor’s net with Kagan, because Sotomayor only dissented two more times with Kagan than with Gorsuch. Thus, Sotomayor’s net with Gorsuch is closer to her net with Kagan than her net with Kagan is to her net with Ginsburg. Because dissenting coalitions only compose small fractions of the Supreme Court’s total composition, most of the justices’ differentials are negative rather than positive. 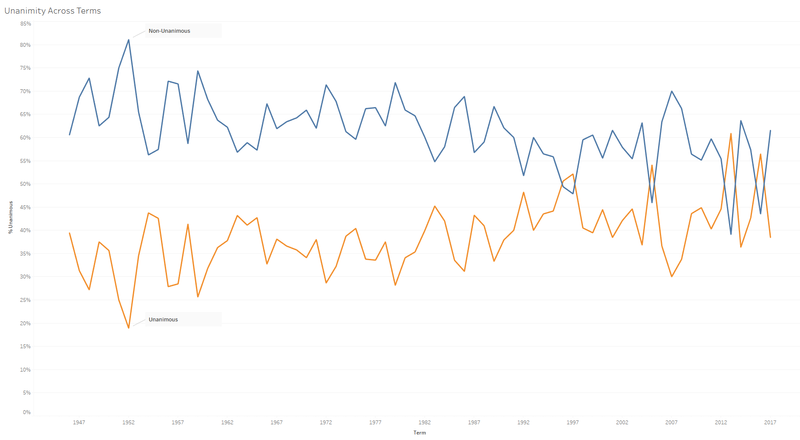 We still see the highest net positive at +10 for Ginsburg and Sotomayor, because Ginsburg dissented with Sotomayor 10 more times than she dissented without her. Instances when Alito dissented with Gorsuch and Thomas dissented with Gorsuch reached the next highest net level, with +5 apiece. We can also glean some interesting information about the newest justice, Kavanaugh, from these data. Kavanaugh is closer to Thomas (based on a higher net figure), Alito and Gorsuch than he is to Roberts, the court’s other more conservative justice. 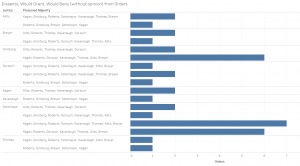 Thomas is closer to Alito and Gorsuch than he is to Kavanaugh, although he is closer to Kavanaugh than he is to Roberts. The same can be said for Gorsuch and Alito, who both run closer to each other and Thomas than they do to Kavanaugh, but both are closer to Kavanaugh than they are to Roberts. 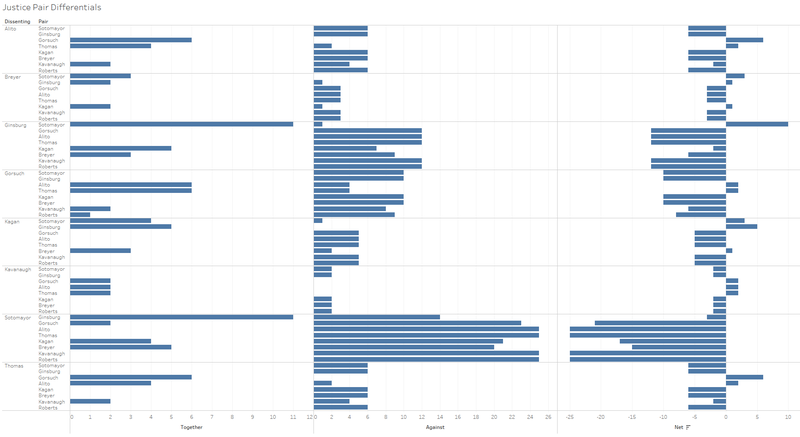 Evidence from the shadow docket shows that disagreements among the justices are more prevalent then the lack of dissents in the Supreme Court’s merits docket so far this term suggests. As previous scholarship suggests that consensus in the court’s merits docket correlates with the court’s perceived legitimacy, this could well be a calculated effort on the part of the justices and particularly by Roberts. In this period when the court is highly politicized, especially in light of President Donald Trump’s repeated appeals to have the Supreme Court resolve challenges to his administration’s actions, it is well worth the court’s effort to enhance its public image. Roberts appears keyed into this potential political quagmire for the court, in which it may need to resolve issues the justices would rather leave to the elected branches, and he has been aware of this potential since before he and Trump traded jabs about federal judges’ political preferences or lack thereof. This makes Roberts’ position as a potential swing justice in cases that are likely to divide the justices ideologically (and politically) all the more interesting to track. The post Empirical SCOTUS: Amid record-breaking consensus, the justices’ divisions still run deep appeared first on SCOTUSblog.